El Nido welcomes the opening of its brand new gasoline station in town. Chevron Philippines Inc. (CPI), marketer of the Caltex brand of fuels and lubricants, recently inaugurated a Caltex service station located along the National Highway, which is conveniently situated across the town’s public market, signaling CPI’s thrust in reaching out to more motoring consumers throughout the country. CPI General Manager Peter Morris enthuses on the robust economic growth and the sustained positive outlook of tourism in El Nido, the so-called last Philippine biodiversity frontier. 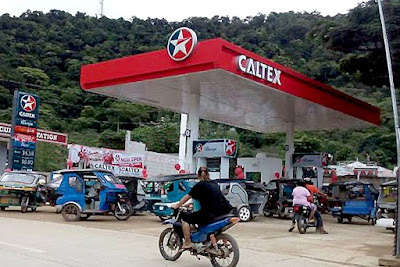 “With businesses continuing to flourish here, along with the influx of tourists, the opening of our new Caltex station in El Nido will not only give easy access to local and visiting motorists, but also create more jobs and fuel more businesses in the community,” Morris said. Complying with Euro 4 standards — the second strictest emission measurement of the European Emission Standards, Chevron aims to take part in preserving the country’s last frontier through its environment-friendly fuel. “We believe that protecting the environment is compatible with providing energy,” added Morris. Chevron’s continuous network expansion in the country aims to provide motorists convenient access to clean, quality and Euro 4 compliant fuels by opening more stations in strategic locations. The newly opened Caltex service station in El Nido is an addition to Caltex’s growing retail service station network across the country. This year, Caltex has opened almost 10 stations in strategic locations all over the Philippines, and is targeting to open a total of more than 30 outlets for the year. Caltex fuels, including Caltex Silver with Techron, Caltex Platinum with Techron, Caltex Diesel with Techron are all designed to deliver lower emissions, higher performance and cleaner engines.